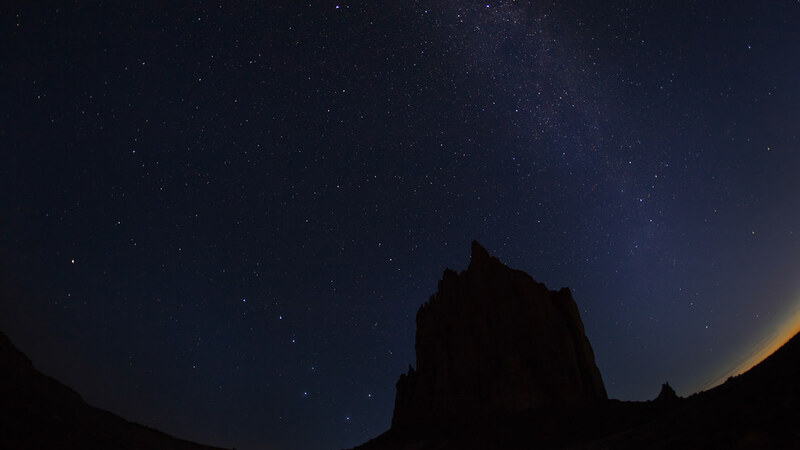 The Milky Way soars over Ship Rock near the four corners region of the Midwest as the big dipper shines brightly while setting over the brightening horizon. The whole reason we had driven so far out west was for a particular event. That event was the annular solar eclipse of 2012. It only happens every so often, and the conditions were just right for us to see the entire eclipse of the sun if we drove out west… so that’s exactly what we did! However, since we were there, we weren’t going to waste a good trip! We literally drove thousands of miles all over the state of New Mexico. One of our stops was Ship Rock. This is quite possibly the most awesome thing I have ever seen. In my previous post, The Lone Ranger, I spoke about how the mountains just keep getting bigger and bigger. Well, that was especially the case with Ship Rock. Ship Rock is all that remains of what used to be a giant volcano! It is what geologists call a volcano plug, or the inside of a cooled volcano that finally eroded it’s walls! It’s a very cool geological formation. It’s basically one giant lava rock! And when I say giant I mean GIANT. Just think of driving for 3 miles straight towards this thing and all it does is gets bigger and bigger! We approached the base of Ship Rock in the wee early hours of the morning and it gradually just blocked out the sky, similar to what you see in this photograph. Standing at the bottom, you have to almost break your neck to see the top and it makes vehicles look like ants next to it. Even with all that, I can’t express the grandeur of this monolith of a rock. I can only say, that if you go out west, make it a point to visit Ship Rock.